Bhakti Charu Swami Seminars: Lecture excerpts from Bhakti Charu Swami Maharaja's class on Nirjala Ekadasi from Lokarno, Switzerland on 20th June 2013. Lecture excerpts from Bhakti Charu Swami Maharaja's class on Nirjala Ekadasi from Lokarno, Switzerland on 20th June 2013. Excerpts from HH Bhakti Charu Swami Guru Maharaj's class on Nirjala Ekadasi from Lokarno, Switzerland on 20th June 2013. · This is hot season. · Nirjala: Ekadasi which is meant to be fasted without even drinking water. 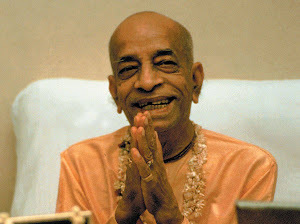 · In ISKCON Prabhupada did not set such lofty standard, since he had to deal with many westerners as well. · Every Ekadasi is meant to be fasted without drinking water. · Bhima had difficulty observing Ekadasi. · Another name of Bhima is Vrkodara, he is very famous for his appetite. · When Pandavas were in disguise, hiding in Ekacakra, half of the food collected was taken by Bhima. · Vyasdeva gave this concession to Bhima. By fasting on Nirjala Ekadasi properly, you will get the benefit of fasting in all Ekadasis in the year. · Even one should acamana very carefully. · Caranamrta also should be taken very carefully. · One should not try to take advantage of these things--taking more than required. · We should be very careful. Ekadasi is an arrangement of the Supreme Personality of Godhead to free us from the sinful reactions. · We should take full advantage of this day. · Nirjala means without water. · Ekadasi means eleventh. Eleventh day of the movement of the moon. · Vedic calculation is based on the movement of the moon, while western one is based on the sun. · A month consists of 30 days, 15 days-waxing period of the moon, and 15 days-waning period of the moon. · All the sins personified in the form of Papa Purusa, responsible for giving miseries through sinful activities. · Krishna also created Yamraj, meant to judge the living entities according to his sinful activities. · Subtle body is the embodiment of the sinful activities. · The living entity does not want to lose the body, so yamadutas whip and drag the subtle body out of the gross body. · Devotees do not need to worry about that, since they have taken shelter of Krishna. · Yamraj asks yamadutas not to trouble them. · Even if devotees go to Yamaraj they are happy to greet him as a mahajan. · Yamaraj's clerk is Citragupta, who keeps a record of all the sinful activities. · So we should be very careful, our activities are getting recorded. · Once Krishna visited Yamaraj, who was very pleased to greet Krishna and washed His feet. · At that time Krishna heard the terrible cries of humans from the southern side. · Yamaraj told Him that the sinful living entities were getting punished. · Krishna went to see how the living entities were getting tortured due to their sinful activities. · Krishna decided, I must do something to alleviate their suffering. · He created a personality, a beautiful young woman--Ekadasi. She is Krishna's internal potency. · Krishna arranged that if anyone fasts on this day, he will be free from all his sinful reactions. · Similarly Ekadasi is another such arrangement of Krishna to free the living entities of all their sinful reactions. · Dharma-sastra: Just observe Ekadasi and be free from all sinful reactions. · Because there were no sins the Papa purusa was dying. · So when Visnu saw this, He asked him why you are in this condition. · Sin: You are creator, so it is Your responsibility to maintain me. Because of Ekadasi, there are no more sins. · Krishna: From now on all the sins on the Ekadasi day will enter into the food-grains. · When the crops become ripe the plant dies and grains come. · For the sake of Papa purusa Krishna made this arrangement that all the sins will enter into grains. · Even if a person has not committed sins, still he gets them. · So that is why we so strictly observe not taking grains. · Devotees should be very careful not to take grains on this day. · Ekadasi is also known as Hari-vasara--day of Hari since it is so dear to Hari. · One who observes Ekadasi immensely pleases Krishna. · There was a demon called Mura. He was so powerful that he defeated all the demigods and assumed the control of the universe. · Being completely disturbed the demigods approached Lord Siva and asked him to help them. · They went to Jagannath. He became very very angry, who dares to interfere in My arrangement. · Mura was extremely powerful and was also supported by millions of other asuras. · He counterattacked the demigods, who were unable to confront them. · The demons then attacked the only person standing there--Hari. · He released one weapon that killed many demons. · Mura decided to confront Him. · The leader themselves go forward. · When Lord's weapons were no longer effective, he started to fight with bare hands. · Chasing Him Mura also entered the cave and found the Lord sleeping. He decided to attack and kill Him. · When he was about to attack, a beautiful woman appeared and stopped him. · A battle ensued between them. Mura's weapons were ineffective. · He started to fight with bare hands. · Vedic tradition: When enemy loses weapons, one also throws his weapons. · With her sharp weapon she cut the head of Mura and killed him. · When the Lord woke up He asked, who are you? · She narrated the whole story. · Lord: Even I could not kill Mura, you have protected Me. You ask for any boon. · Beautiful woman: From now on, whoever observes the austerities on this day, please free him of all sinful reactions. · Utpanna Ekadasi: She appeared on this day. · It is good for health also. Our system gets complete rest. We have a tendency to overeat. · The fire of digestion burns the undigested food and then starts burning the toxins also. · Our purpose should be to fast for spiritual benefit.